Suitable for sensitive and / or damaged nails caused, for example by the use of artificial nails or illness. TIP: Use in combination with TRIND Keratin Nail Protector for extra strong nails. Oil free formula allows quick application of your nail polish. Contains hydrolyzed keratin, vitamin E and B5. Apply a thin layer of TRIND Keratin Nail Restorer on bare nails. Allow to absorb for 1-2 minutes. Massage excess product (if any) into the nail plate. 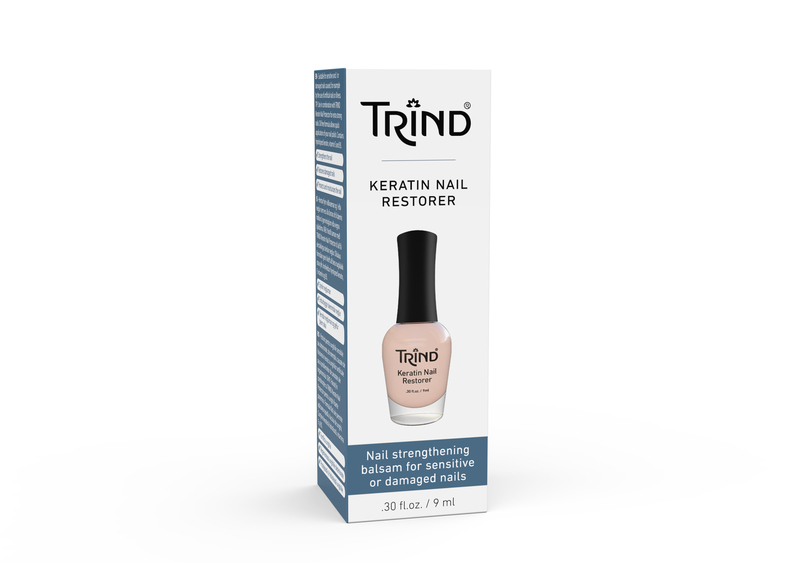 Use TRIND Keratin Nail Restorer daily to strengthen and improve the condition of your nails. For protecting your nails and enhancing the efficiency, use this product in combination with TRIND Keratin Nail Protector. This treatment can be used as long / often as needed, depending on how badly the nail is damaged or to get the desired result (Step 1: Remove old layer every day with TRIND Nail Polish Remover. Step 2: Apply TRIND Keratin Nail Restorer, massage into nail and allow to dry. Step 3: Apply TRIND Keratin Nail Protector on top). After use, clean the rim of the bottle.